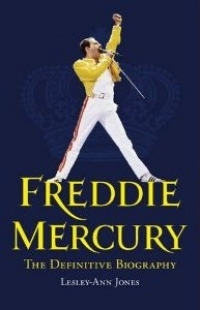 This is the definitive biography of Freddie Mercury. Written by an award-winning rock journalist, Lesley-Ann Jones toured widely with Queen forming lasting friendships with the band. Now, having secured access to the remaining band members and those who were closest to Freddie, from childhood to death, Lesley-Ann has written the most in depth account of one of music’s best loved and most complex figures. Meticulously researched, sympathetic, unsensational, the book – like the forthcoming film – will focus on the period in the 1980s when Queen began to fragment, before their Live Aid performance put them back in the frame. In her journey to understand the man behind the legend, Lesley-Ann Jones has travelled from London to Zanzibar to India. Packed with exclusive interviews and told with the invaluable perspective that the twenty years since Mercury’s death presents, Freddie Mercury is the most up to date portrait of a legendary man. exactly the sort of tribute Mercury himself would have wanted. Gloriously populist, never taking itself too seriously, but nonetheless full of perceptive and moving insights into the contradictions and flaws of a truly charismatic star. Jones’s status as a showbiz journalist who knew Mercury means there are lots of fascinating details. How did a shy little Parsi boy from Zanzibar named Farrokh Bulsara become one of the world's most legendary rock superstars? The answer is painstakingly detailed in this stunning biography of the late Queen front man...Jones delves deep into Mercury's decadent and promiscuous life after spending years interviewing the flamboyant star and his inner circle of family members, band mates, long-term lovers, close friends, and music industry insiders. Mercury goes beyond the glittering façade to get an unvarnished look at Queen's rise to fame, the loves of Mercury's life and his fraught relationship with his conservative past, creating a complete portrait of this magnetic musician. Jones's band history proves to be the ultimate fan's resource: she thoroughly documents the development of each album's release, promotion, reviews, and infamous tours-including the background and production of their classic "Bohemian Rhapsody." In this exhaustively enjoyable read, Jones combines her own detailed research with the brutal honesty of family and friends, media and music insiders, bandmates and bedmates. Jones documents the band's rise to international superstardom and digs deep into Mercury's past via 100 new interviews with those closest to Mercury…A must-read for any Mercury, Queen or rock fan…a truly intimate portrait.